Through conversations with many experts, I have recently discovered how vast and varied this species can be. With possibly thousands of sub-species, or cross-bred varieties, it can be virtually impossible to definitively identify a Common Juniper to its exact variety; especially if collected from the wild! Trees 48 and 49 and were grown by a private collector, I am told from cuttings, many years ago. No. 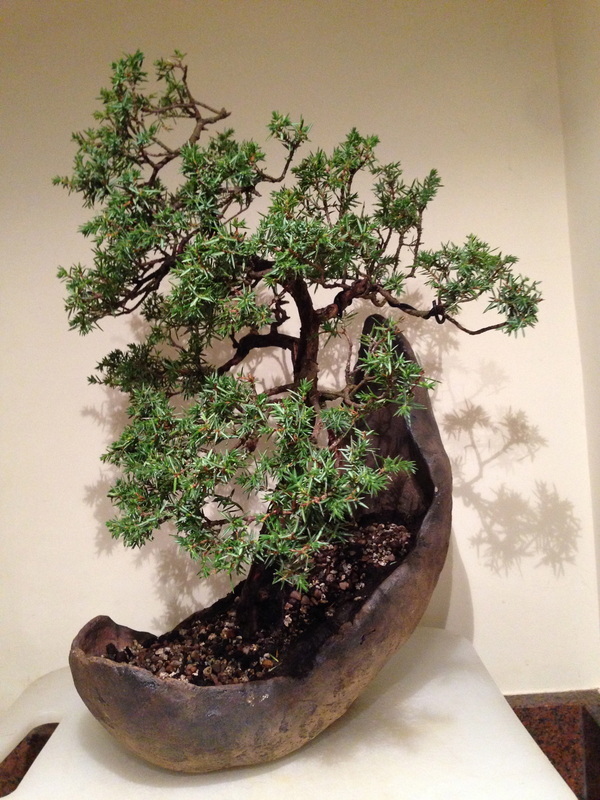 49 The need for a re-pot gave me the opportunity to consider the trees overall style. 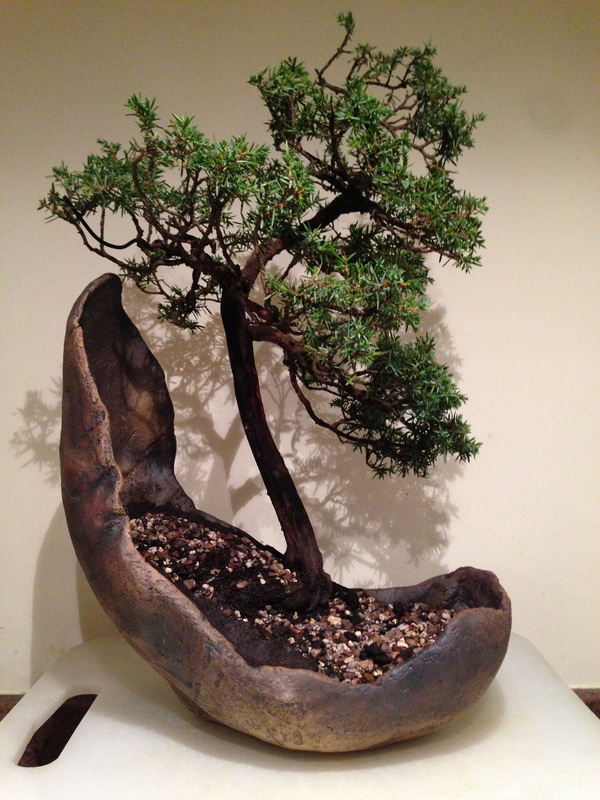 Although the Inside lower branch offered some redress, I felt the tree was still somewhat unbalanced, with the centre of gravity falling to the very edge of the pot. 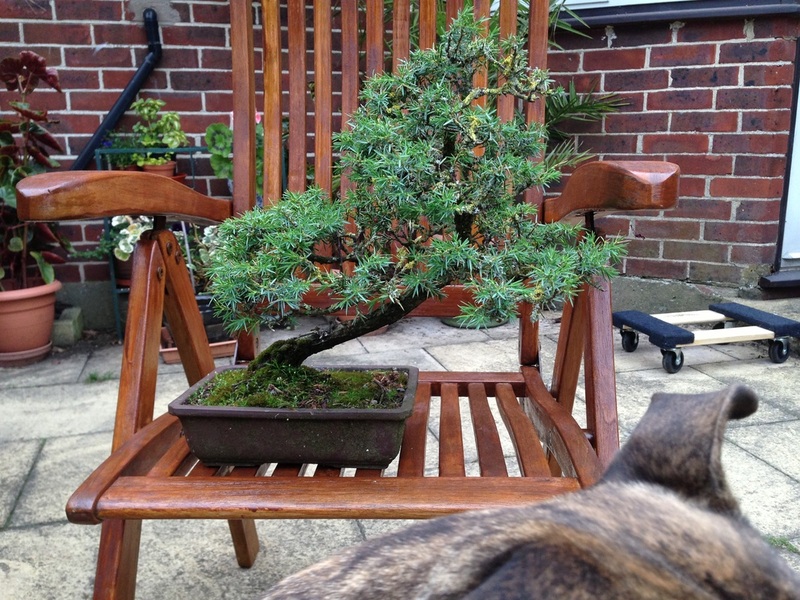 After considering various options, it was decided to change the planting angle and style of the tree. 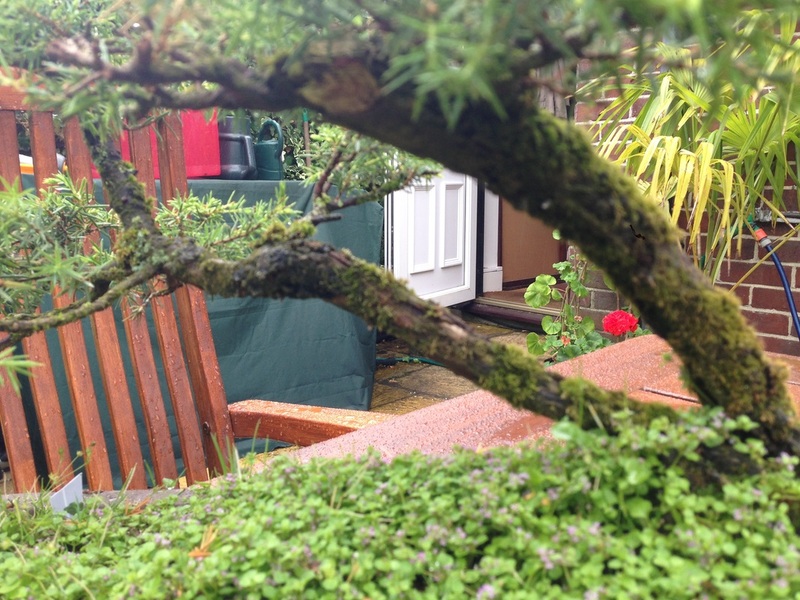 This upright angle also highlights the foliage more than the relatively thin trunk, which with a few seasons of pruning and wiring, should be fuller and more structurally defined. 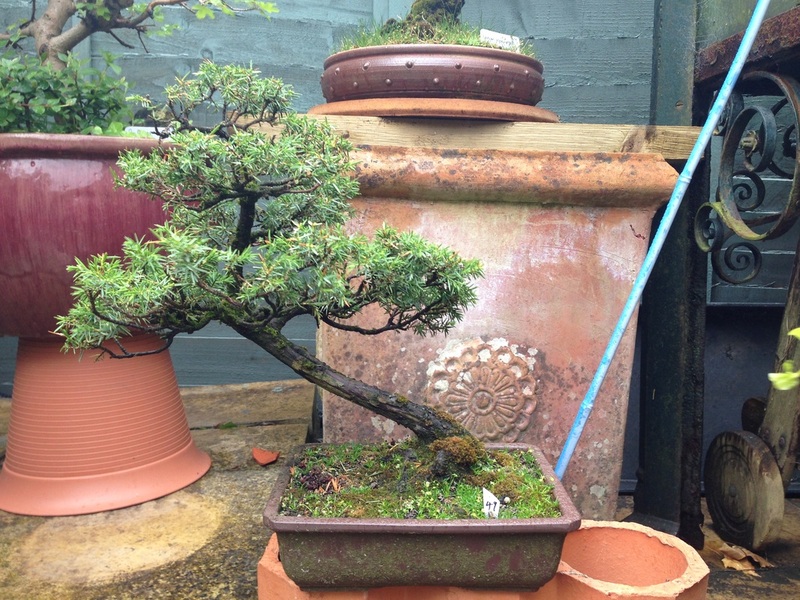 It was felt that this crescent shaped pot from China Mist complimented this new planting angle and style of the tree, suggesting it may be growing near the base of a mountain, at a relatively shallow incline, but still needing to reach out for light once it had outgrown nearby competitors. Just need a little more wire to bring the apex down. Pruned and re-potted into this China Mist crescent pot, with keto retaining walls! No. 48. 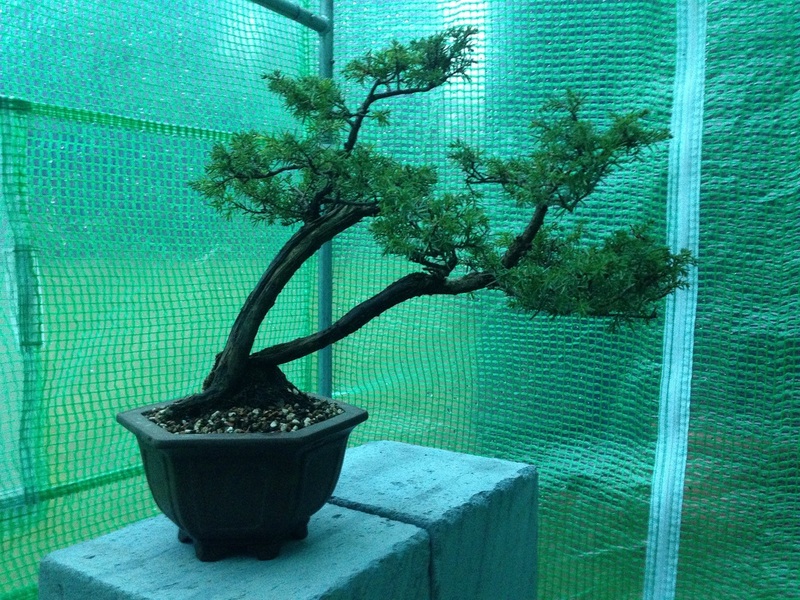 A lovely old juniper which came with dwarf mint. 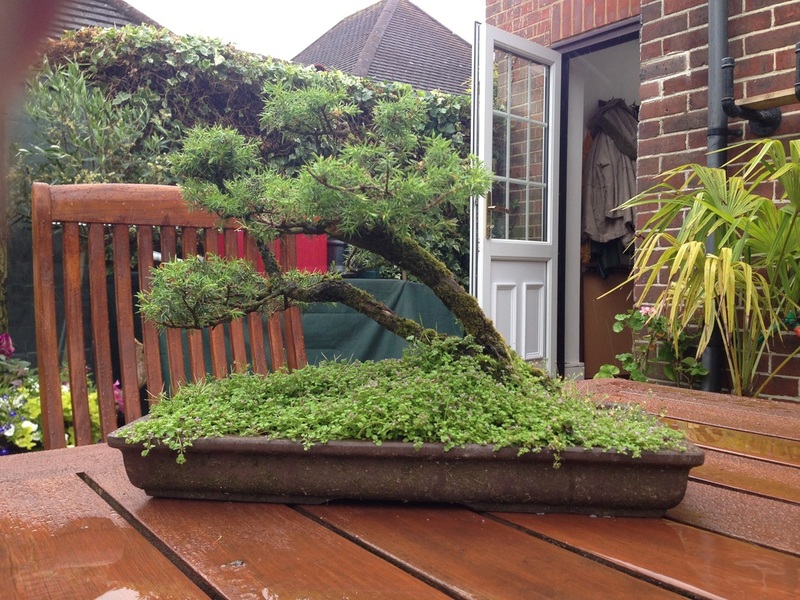 After a slight prune, I spent hours carefully cleaning the trunk and branches of moss, then carefully root pruned & re-potted into this mountain style Master Xu pot. I believe Junipers in general like to be relatively pot bound, which it was, and some Common Juniper varieties have relatively delicate roots, so she's in the polytunnel for re-coup, and will stay in this pot for the next 4 or 5 years. I will prune the foliage over the next few seasons to develop the 'pads' and might add some wire to refine branch placement, although I don't feel this is urgently required.